FILE - A Nigerian woman validates her voting card with a fingerprint reader so she can vote later in the day in the town of Daura, March 28, 2015. The United States’ landmark Voting Rights Act, despite what many see as its recent weakening, is a global rarity in terms of legislation that explicitly safeguards minorities’ access to the ballot. Its 50th anniversary on Thursday comes amid international efforts to expand voting opportunities to those who’ve had little voice in government. "Across the world, to the best of my knowledge, there's no law as specific in its protections as the U.S. Voting Rights Act of 1965," said Pat Merloe, who, as electoral programs director for the nonpartisan NGO National Democratic Institute in Washington, has visited 65 countries. Referencing a 2013 Supreme Court ruling, he added that, "While the protection of that act has been curtailed … across the world, there’s a general trend to make the vote ever more available – to minority populations, indigenous peoples, peoples with disabilities, those who have been convicted of crimes." The U.S. high court had invalidated part of the law requiring that a group of primarily Southern states with histories of racial discrimination get federal approval before changing voting procedures. Since that decision, some states have adopted measures such as stricter registration requirements or scaled-back early voting options, sparking legal challenges that these disproportionately affect the poor, minorities, seniors and students – and discourage their electoral participation. "Although there is no single requirement in the U.S. that is unique, the cumulative constraints in states with tougher ID and registration standards place these states among the most restrictive voting environments in the world," says a “rough guide to global voter restrictions" published last year by the International Consortium of Journalists. The data-based guide identified "wide variety within regions" on whether voter registration is automatic or requires individual effort, and it found widespread voting prohibitions linked to criminal convictions or mental disability. It noted other global voting exclusions: for military personnel in Colombia, Egypt, Turkey and Venezuela, all countries that have experienced military coups; for judges in Egypt and Somalia; and for women in Saudi Arabia. For the first time this December, Saudi women will be able to vote in local elections. The International Institute for Democracy and Electoral Assistance, an intergovernmental organization based in Stockholm, added resident aliens and ex-patriots to the list of groups facing restrictions in many countries. It said debate continues over whether and how to remove those barriers. "From a global perspective, the practice of restricting voting rights for certain groups is a thing of the past," the International IDEA told VOA in an unsigned email. "But there are occasional reports about restriction of voting rights for minorities, for example Myanmar’s restriction of voting for Rohingyas, or electoral practices effectively excluding religious and ethnic minorities across various states in the 2015 Nigerian elections." The email expressed concern over legal challenges to the U.S. voting law. It also observed: "A legal framework such as the U.S. Voting Rights Act is an important element to enable the political participation of minority groups – but it is not the only one." Most countries "have the universal suffrage principle ratified in their constitutions and/or specific electoral laws." For example, the International IDEA called South Africa’s constitutional bill of rights "exemplary" for provisions such as ensuring voting protections "for every adult citizen." The country officially ended apartheid in 1994. Governments that require voter proof of identification can increase confidence in elections but also "significantly impact the ability of citizens to register to vote and cast a ballot," voting rights expert Tova Andrea Wang found in comparing such practices in Africa and Latin America for The Carter Center in Georgia. She’s a fellow with the liberal think tank Demos in New York. 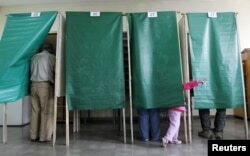 FILE - A child gestures during 2012 municipal elections in Valparaiso, Chile. The country reportedly works hard to enfranchise voters. Governments with strict voter registration rules have an obligation to help eligible voters meet them, Wang contends, but most of the countries surveyed "fail to meet the obligations outlined in international law...."
But Chile, Panama and Peru, for instance, have made concerted efforts to enfranchise voters, Wang told VOA. "In some places in South America, they will go by helicopter" to rural areas to make sure indigenous people get appropriate voting documentation, at no cost to them. "Most countries don’t have or don’t want to expend the resources to ensure that," Wang said, noting it’s costly to produce and process ID cards and maintain a national database. "I cannot imagine any government in the United States putting in the kind of funds [for that]. Nor do I think the American people would be interested." Joe Lenski is an executive with Edison Research, a New Jersey-based firm that conducts voter research in the United States and, to date, seven foreign markets: Azerbaijan, Cyprus, Georgia, Iraq, Mexico, Taiwan and Venezuela. From what he’s seen, "in most cases, voter registration is pretty straightforward," Lenski said. However, he acknowledged that the threat of violence in Iraq’s Anbar and Nineveh provinces during the April 2014 parliamentary elections intimidated some voters and led his firm to pull its field interviewers. Otherwise, registration and polling are transparent, he said of his experiences abroad. "My observation is that where the questionable practices occur is during the vote counting, not during the registration." Foreigners question some U.S. practices, too. Lenski said they’re baffled by the United States’ election system, which gives leeway to the states in how they conduct voting. "The idea that you have 50 different jurisdictions setting up different election laws strikes most of the international election people I work with as kind of nuts," Lenski said. "But that’s the way we’ve developed as a country." International IDEA maintains an extensive database of countries’ voter turnout for presidential and parliamentary elections. The CIA World Factbook also provides voting snapshots by country, noting age of eligibility – starting anywhere from 16 to 25 – and whether polling is voluntary or compulsory.